I don’t want to brag or anything, but I’m kind of a mayo ninja. 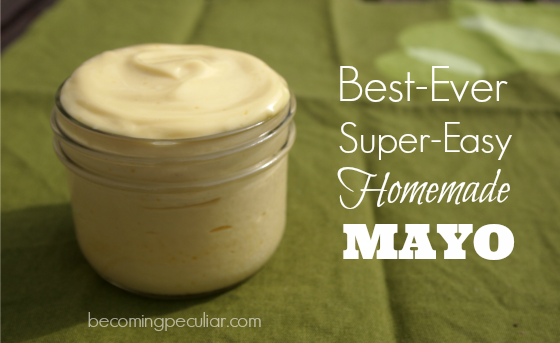 Eventually, I managed to combine the best of all these recipes to find the ultimate perfect (and ridiculously-easy) mayo recipe. In my humble opinion. Even in the midst of first-trimester yuckiness, when I couldn’t bear to make dinner for a month and opening the fridge was an exercise in self-torture, I still managed to whip up a batch of my awesome homemade mayo. It’s one of those things where the homemade version is SO AMAZING and the store-bought alternative SO AWFUL (mostly in terms of gross ingredients) that you just can’t go back once you’ve tasted the real thing. And it’s easy to boot! 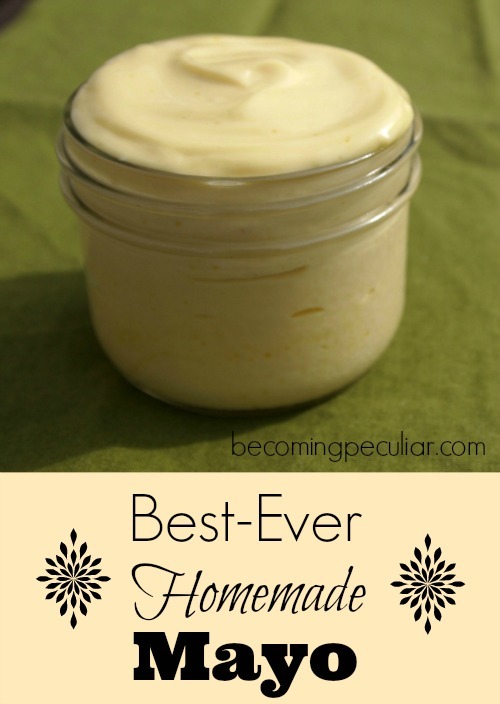 If you have never tried homemade mayonnaise, you have not begun living. The stuff you buy in the store WISHES it was a mere imitation of the real thing. It is a mere shadow, an echo, a whisper of what beauty emerges when you emulsify oil with egg and lemon. And the list goes on! It’s great in tuna, macaroni, or Waldorf salad; it’s wonderful on sandwiches; it tastes divine on hard-boiled eggs . . . I can’t stop eating this mayo! The best thing of all, I think, is the fact that you don’t have to feel guilty slathering your sandwiches in this delectable spread. 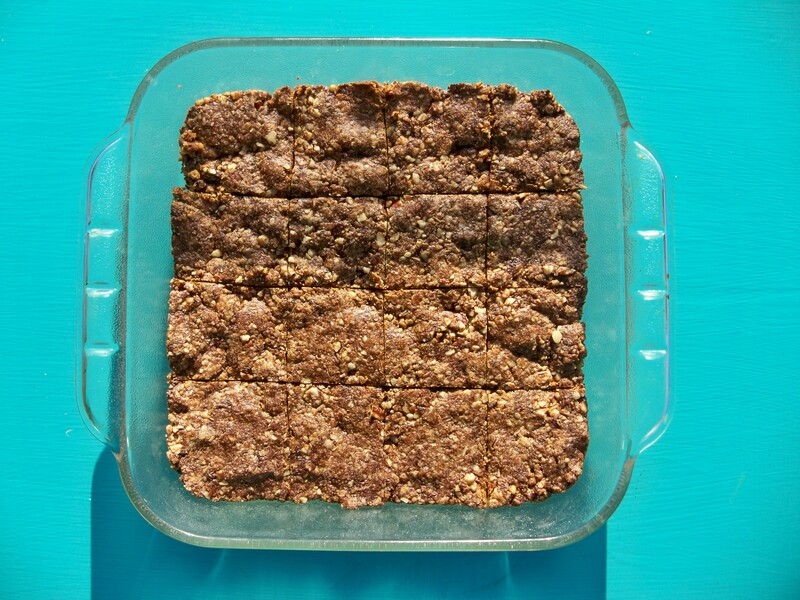 It’s made with healthy ingredients and good fats, so you can enjoy it without regret! Okay, I know my recipe has some sugar in it, and I know that sugar is evil. You can totally omit it. But to me, that tiny bit of sugar is the difference between “good” and “out-of-this-world.” Your call. Either way, at least it’s not Miracle Whip. My one caveat is that you must use quality eggs from a source you know and trust, since they will remain raw. 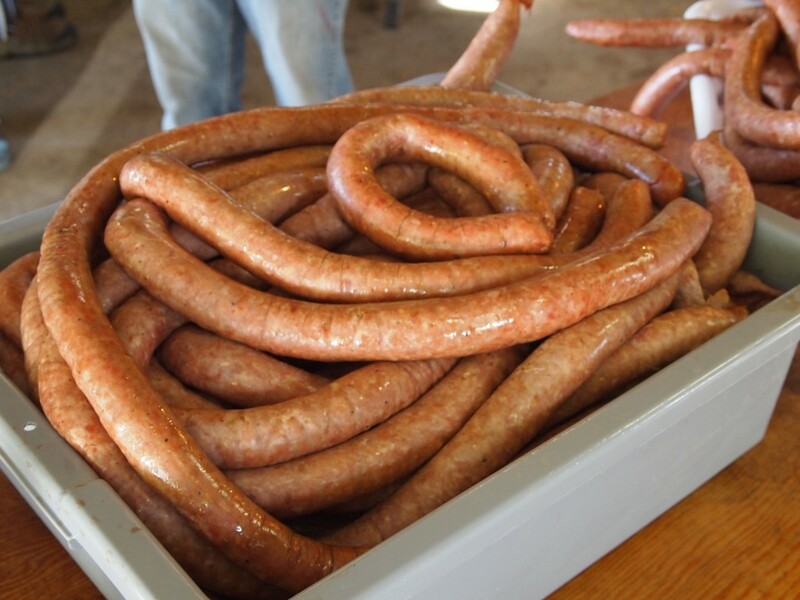 Fresh from a farm is ideal. I only use eggs from my parents’ chickens, which are free to roam and graze all day. I would be hesitant to use any old store-bought eggs, since I have no way of knowing whether the birds were healthy. I would not want to risk salmonella poisoning! 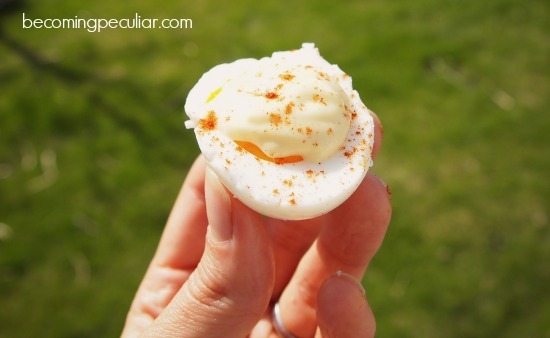 Lots of recipes require you to use yolks only, and many of them. I used to do this. I never knew what to do with the whites, and it made my mayo an unappetizing yellow. Turns out, I actually get lovelier, fluffier mayo if I use one whole egg. It’s cheaper and easier, too. Who knew. All that being said, let’s move on to the mayonnaise-making! Now, you are much more likely to have success if you bring your egg and lemon juice to room temperature. You could let them sit on the counter for three hours, but usually when I want mayo, I want it RIGHT NOW. So here’s what you do: crack your egg and pour your lemon juice into a small glass. Fill a bigger bowl with hot tap water, and immerse the cup in the water (without getting any water into the cup — the way some people warm up a baby bottle) for a few minutes until the contents have warmed to room temperature. Food processor method: Pour the warmed egg mixture into your food processor and blend for a few seconds, just to get it mixed. 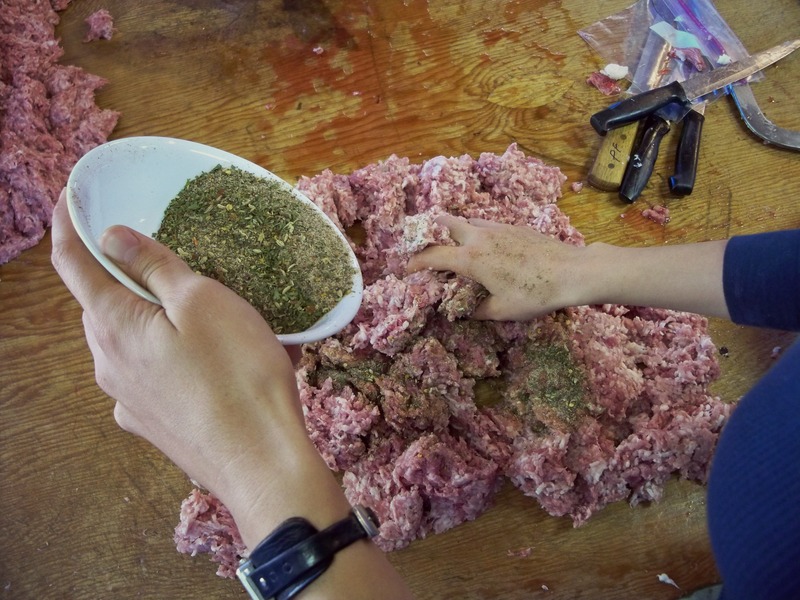 Add the mustard powder, salt, and sugar, and blend a few seconds longer. Now comes the slightly tricky part. You need to add the oil S-L-O-W-L-Y while the blade is running. 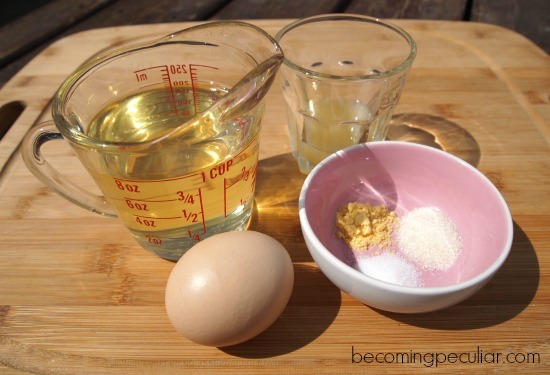 Have your oil ready in the measuring cup to make pouring easy. Turn on the machine, and start to drizzle in the oil — the thinnest stream you can possibly manage. Keep it running, and continue to pour — again, s-l-o-w-l-y, until the oil is gone. Be amazed as the oily, messy contents of your food processor gradually and magically begin to turn white and creamy (emulsification, baby!). But don’t get hasty. Keep drizzling. This process will take you a couple of minutes, but it will be SO WORTH IT. And you’re done! 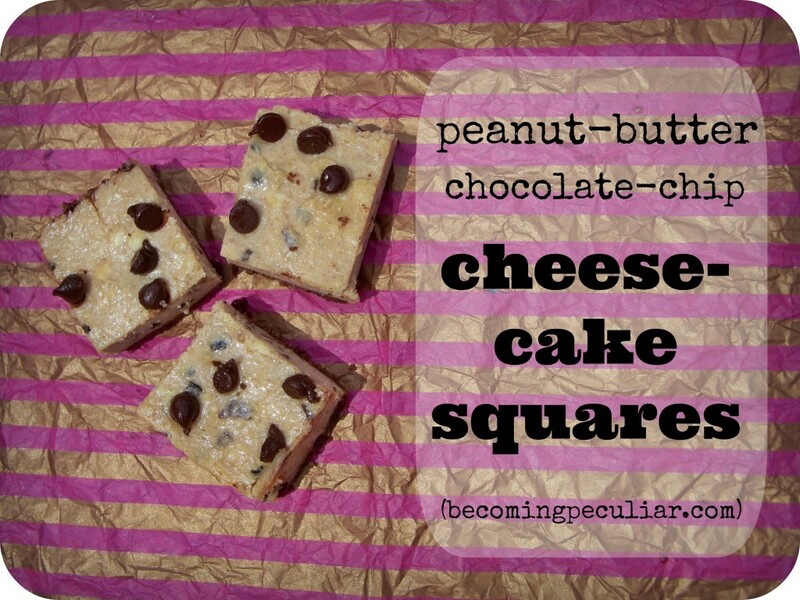 Scrape all that creamy deliciousness into a glass container with a rubber spatula and start slathering! I’m told homemade mayo can be kept in the fridge for a week or so, though I’ve gone longer. 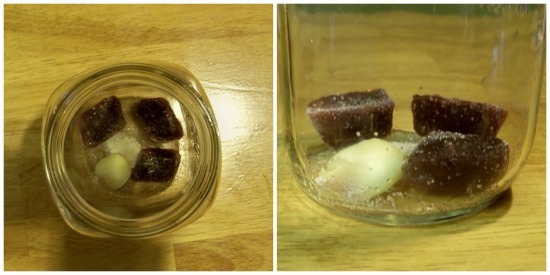 If you want to preserve it to last longer, you can try this method of lacto-fermentation, if you’re the kind of person who has whey hanging around in your fridge. (Just add a Tbsp liquid whey along with the lemon juice; then after it’s made, let it sit on the counter for 7 hours before refrigerating). I’ve done this dozens of times, but it adds a few steps, and lately I don’t need mine to last that long. 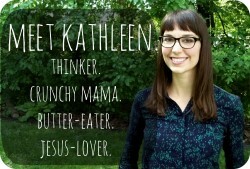 It goes quickly when you start using it in all your dressings and dips! 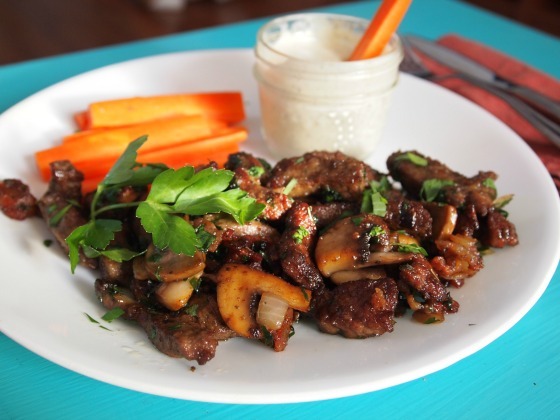 Liver is also a frugal choice — it’s usually quite inexpensive. And being able to use the whole beast reduces waste. Just too bad it tastes so darn awful. I have never like beef liver. Now I am not a picky eater. I will eat just about anything. Exotic, spicy, sour, bitter, fermented . . . I just love food. Vegetables, seafood, meat, grains, dairy, all of it. Thai, Mexican, Lebanese, Greek, Italian . . . YUM. All different textures, all different flavours. You’d be hard-pressed to find something I wouldn’t eat. And I love trying new things and experimenting in the kitchen. 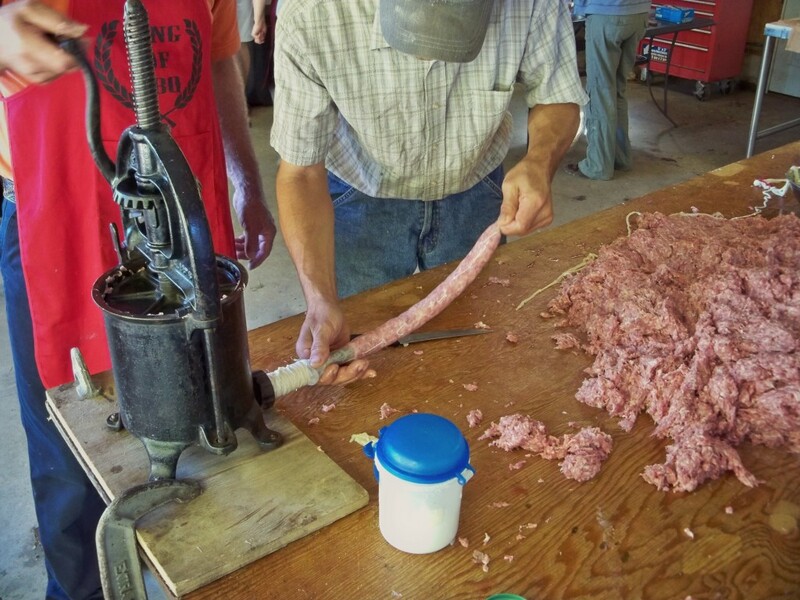 And I’m not particularly squeamish, either — I can eat other organ meats just fine. 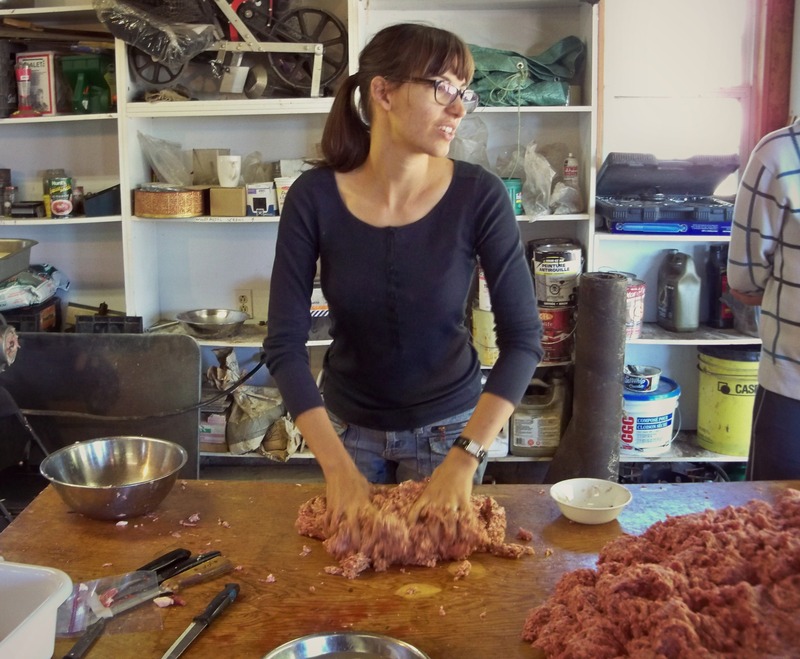 I’m actually quite fond of chicken liver, and I grew up fighting my siblings for chicken hearts and stomachs. 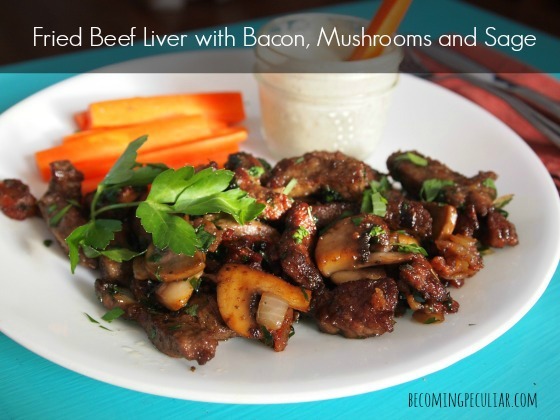 But I’ve just never cared for beef liver. I just couldn’t get past that bitter, metallic flavour and stringy texture. My mom used to make a stew with liver, tomatoes, and corn, and I always wanted to cry when I heard it was for dinner. It was torture having to eat that stuff. 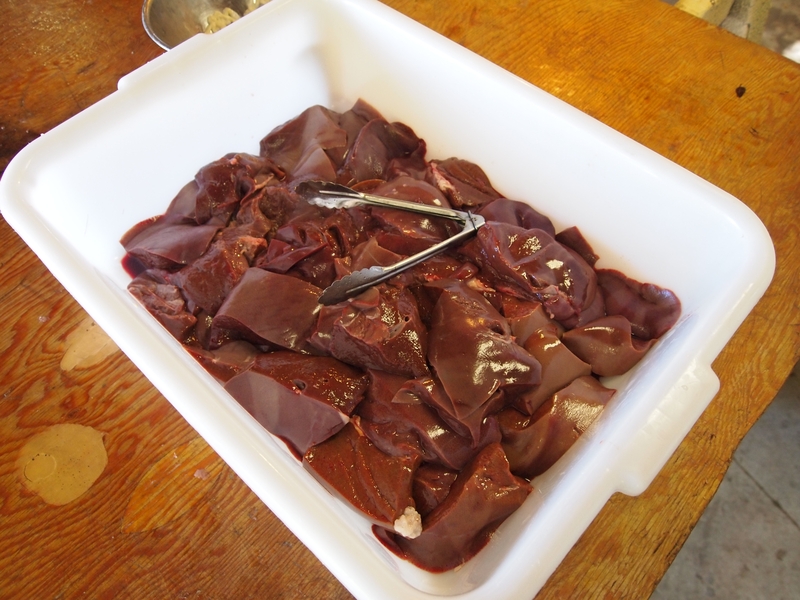 This last year, I ended up with EIGHT packages of liver. Holy smokes! But what to do with the stuff to make it edible? I tried for years to like it, to no avail. Until I tried (Not Your Average) Liver and Onions from Edible Aria. This recipe changed my life. Not only could I stomach it; I loved it! It was delicious! My husband and two-year-old daughter agree. I have made this dish three times in the last year or so, and each time we have all happily cleared our plates and gone for seconds. I could not believe this was the same thing I had hated for so many years. The original recipe is rather vague in its quantities and instructions, so I thought I’d offer a more precise and thorough version (with minor tweaks). If you eat it with an open mind, I think you will be amazed. Unless you don’t like mushrooms or bacon, in which case I can’t help you. It is my opinion that every ingredient in this recipe is essential to making it delicious. But especially the sage, bacon (LOTS of bacon), fresh parsley (it MUST be fresh), and mushrooms. You just need them. Also: In the past I have rinsed my sliced liver with water and then soaked it in a small amount of milk for about half an hour. Legend has it that this gets rid of the strong organ-y flavour. I thought it was really effective — it came out really mild-tasting. But then this last time I skipped the soaking, and couldn’t really tell the difference. But if you really want to avoid the strong flavour, you can always try it. It can’t hurt. 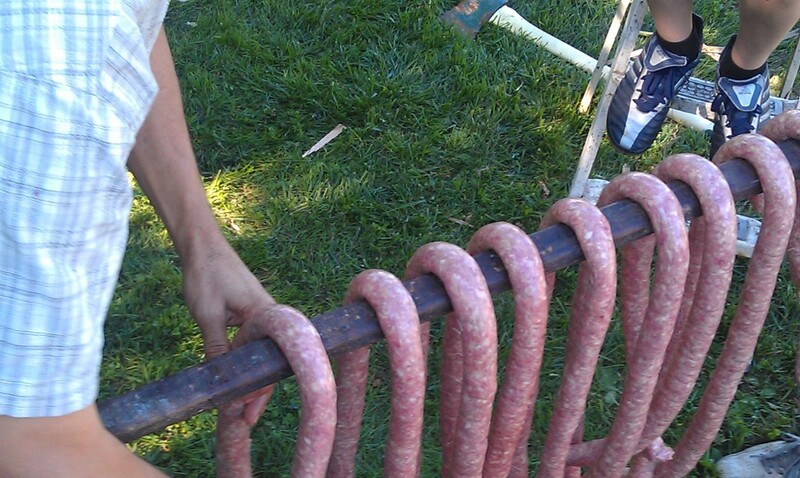 Just be sure to drain it and dry well with paper towel after so it will fry well. Also be sure to remove as much of the outer membrane as possible. As you slice, you generally can peel it off. It helps eliminate any funky texture. Fry bacon over medium-high heat until crisp. Remove from pan with a slotted spoon and set aside. Add onion to pan and continue to cook in bacon fat until well browned. 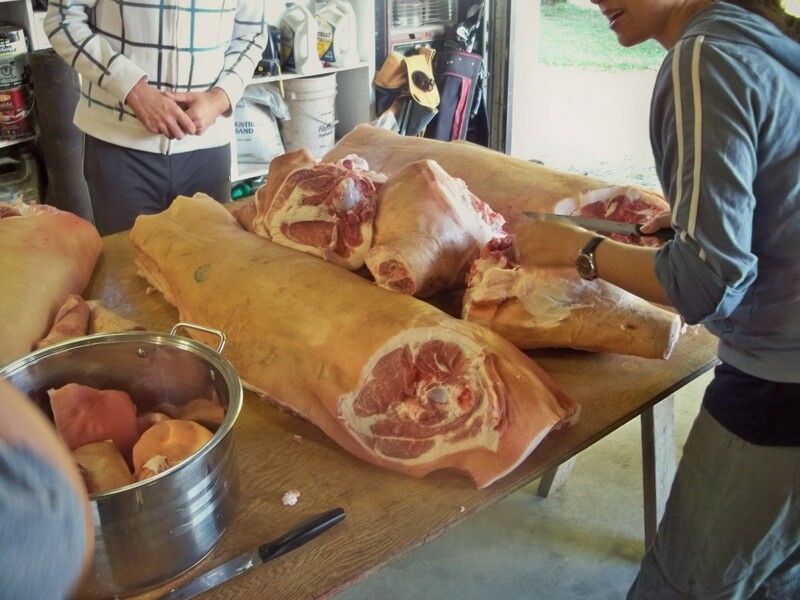 Remove with a slotted spoon (just add it to the cooked bacon you’ve set aside). Add butter to the hot pan and combine with the remaining bacon fat. 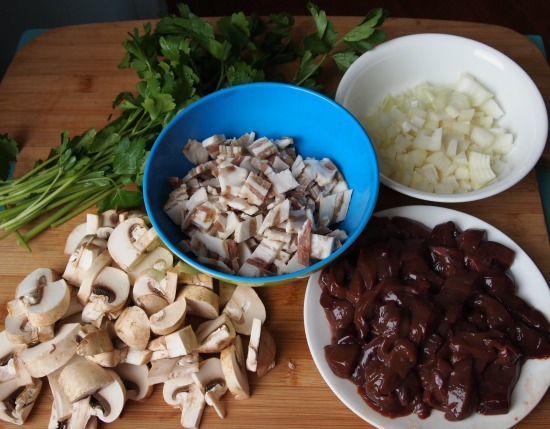 Add mushrooms and sauté until they begin to crisp on the edges. (Add lard or tallow as needed). Remove from pan. 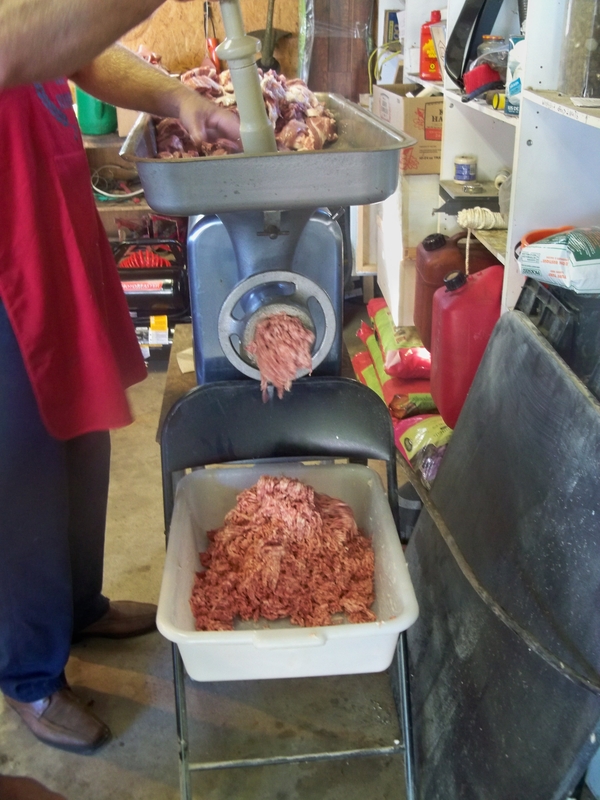 Meanwhile, lightly dredge liver in flour mixture. 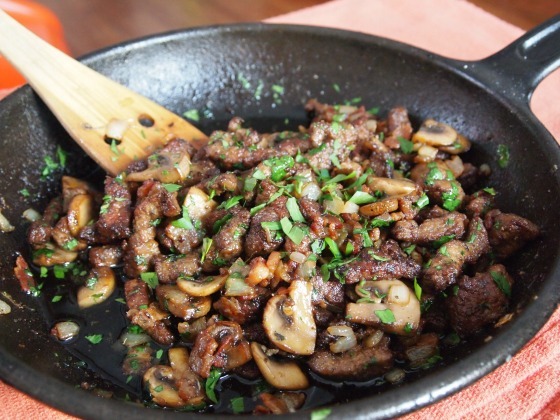 Make sure that the skillet is still good and hot, then add strips of floured liver and fry in batches until crispy. When it’s all fried, add everything back to pan along with sage and parsley. 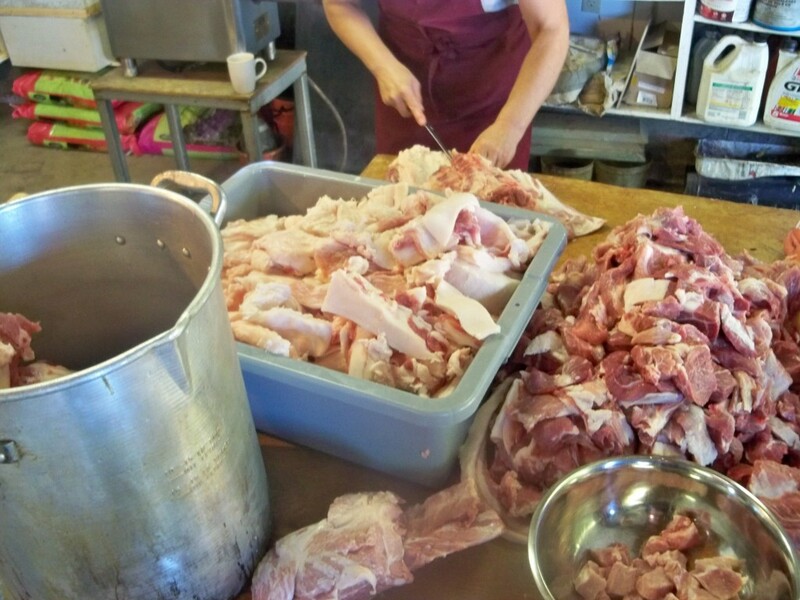 Cook until liver is cooked through. Sprinkle with a little more parsley and be amazed that this fantastic dish contains more nutrients than you can count on your fingers. 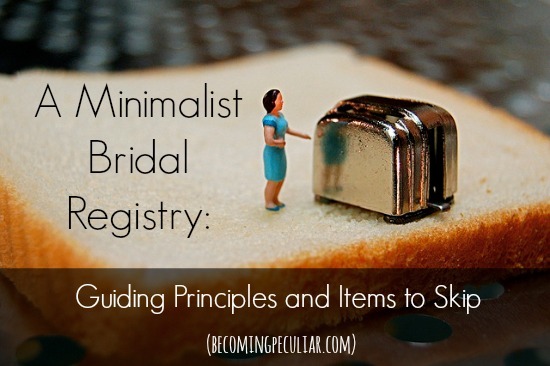 When I was creating my bridal registry nine years ago, I had no idea what I was doing. I was 20. I had never lived alone. I hadn’t done a lot of cooking, and I didn’t know what I would need. I made my registry at Wal-Mart and registered for all the cheapest stuff I could find. I thought I was doing my guests a favour, and didn’t think there was any difference between expensive stuff and cheap stuff except cachet. I ended up getting a lot of things myself from the dollar store, thinking it was just as good as anything. I had no experience with that kind of thing and didn’t know what would actually be worth a splurge. It’s been almost nine years since then, and I’ve learned a thing or two about what I actually find useful, and what’s worth the extra cash. I’ve also discovered what is a total waste of money, and just adds to the clutter. I regret most of my registry choices. 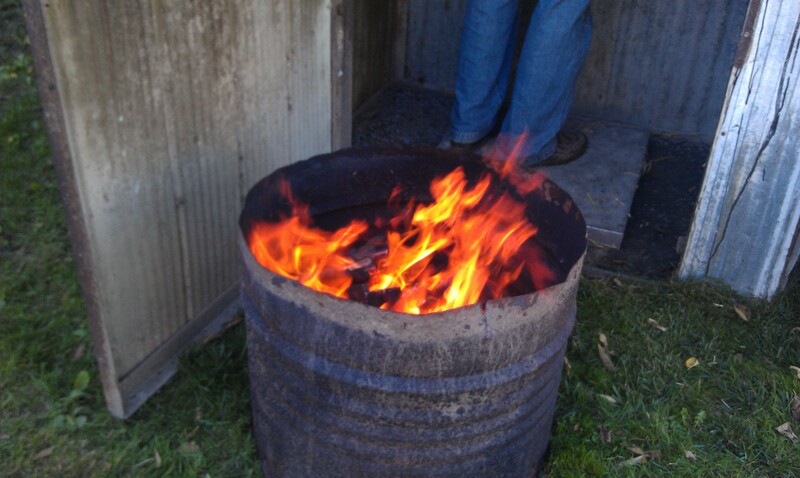 Most of it ended up being junk that needed to be replaced in a matter of years. I’ve spent the years since replacing many of those things with useful, good-quality items that I hope will last the rest of my life. So I thought I’d share some of the wisdom I’ve amassed since then. Look for durable items. Have long-lasting in mind. Things like sturdy drinking glasses and reliable brands (e.g. Corelle for dishes). Look for classic styles that won’t quickly go out of date. They might feel like the more boring choices, but at least they won’t look dated in ten years. (And I want my stuff to last more than ten years.) In other words, you might want to avoid aqua, chevron, and bird silhouettes. 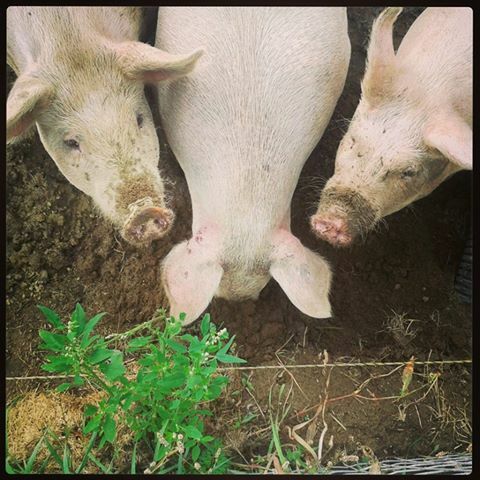 They look pretty now, but they’re the dusty roses and forest greens of tomorrow. Avoid plastic. It will crack and melt. 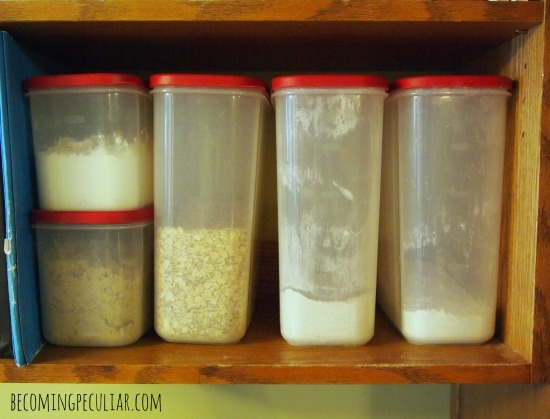 There are a few exceptions (like Rubbermaid storage containers), but plastic is generally not made to last. Plus, you risk leaching toxins into your food. Choose glass, ceramic, stainless steel, and wood where possible. Avoid items that only serve one purpose. You can’t always do this (i.e. you probably want a butter tray to only store butter); but in general, try to think of a few good items that are multi-purpose instead of buying a hundred different things, each with its own purpose. 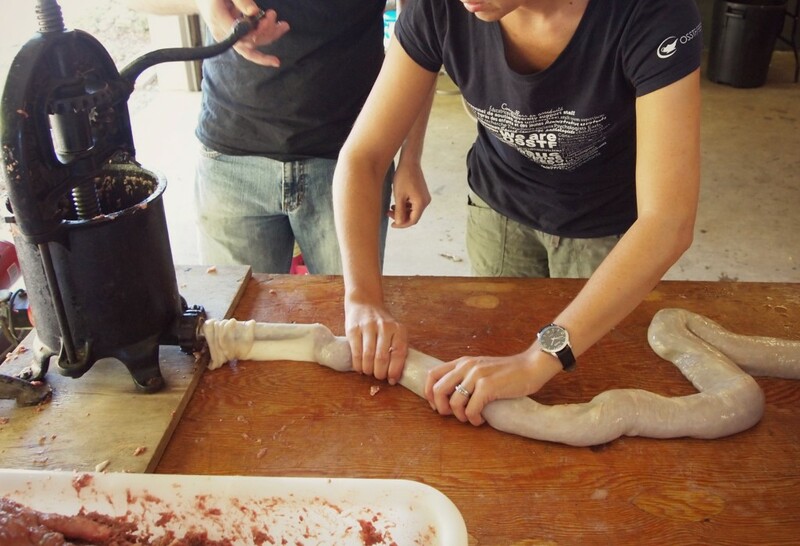 How often are you really going to use a strawberry huller? 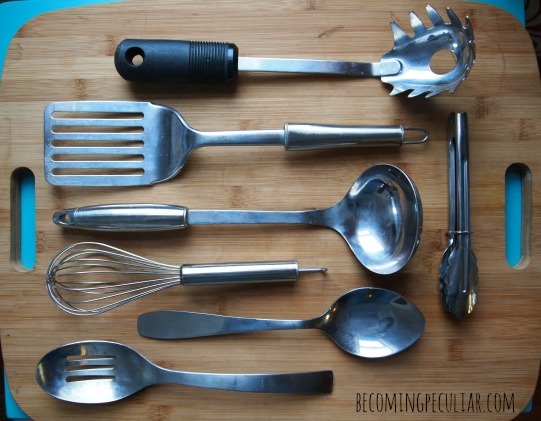 I’ve nixed the following items — even though they’re incredibly popular and can be found in most kitchens and bridal registries — either because they’re questionable in terms of toxicity; they’re not made to last; or they only serve one function (which would be better achieved with another tool). Microwave. Maybe I’m paranoid, but I just don’t trust ’em. We reheat food either in the toaster oven or on the stovetop. It takes a few more minutes, but you get used to it. Nonstick frying pan. 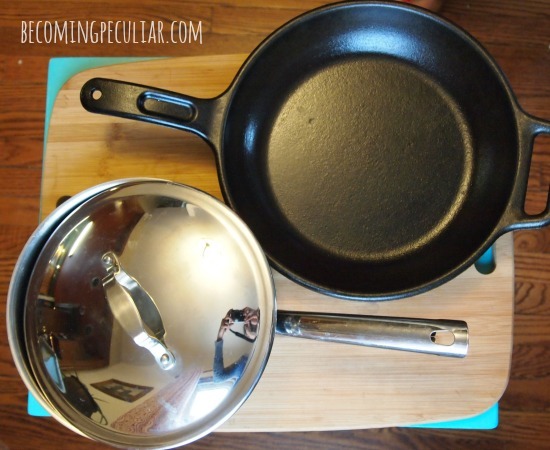 Not only is Teflon kind of scary, but it’s way too delicate. All the nonstick pans I’ve ever owned are long gone because the coating chipped and flaked within the first couple of years. You definitely don’t want to ingest Teflon bits. I prefer stainless steel and cast iron for frying and stovetop cooking. Knife block. You do not need that many knives. You need three. Most knives that come in a knife block, you’ll never use. 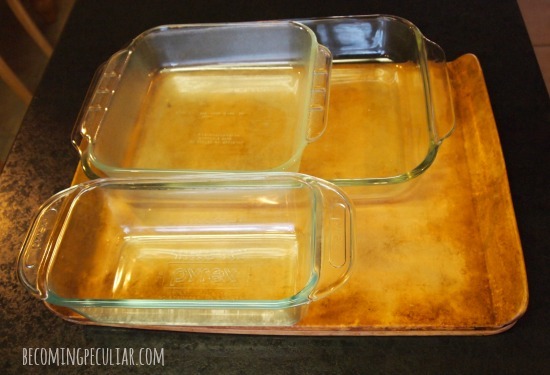 And storing them on your counter takes up precious space that could be better used. 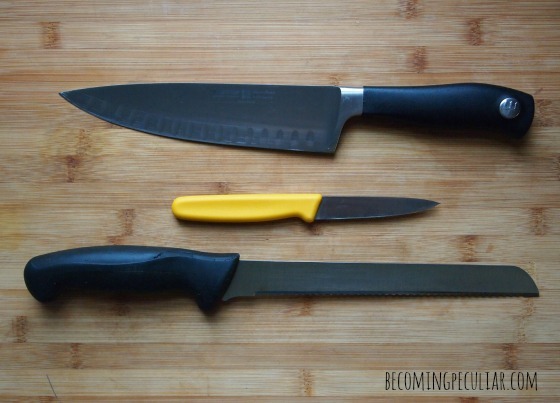 More thoughts on knives in my next post. Toaster. That’s a bulky appliance for only one function (toasting sliced bread). What a waste. We haven’t had one for years. Use a toaster oven. Kettle. This might be different if you’re a big tea-drinker. 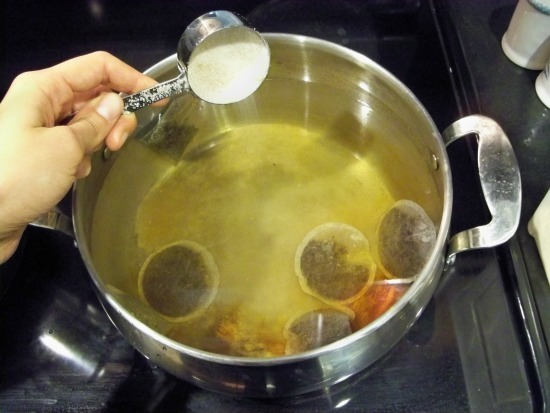 But if you’re short on space, a pot on the stove-top works just as well and is much easier to clean. So now that you have a few general principles to guide you, and you know what I don’t recommend, what do I recommend? My suggestions can be found here: A Minimalist Bridal Registry — Tools for a Lifetime of Fabulous Food. Anything else you’d add to my avoid list? Do you think any of mine are crazy? What other guiding principles would you suggest? Image courtesy of JD Hancock. Finally! 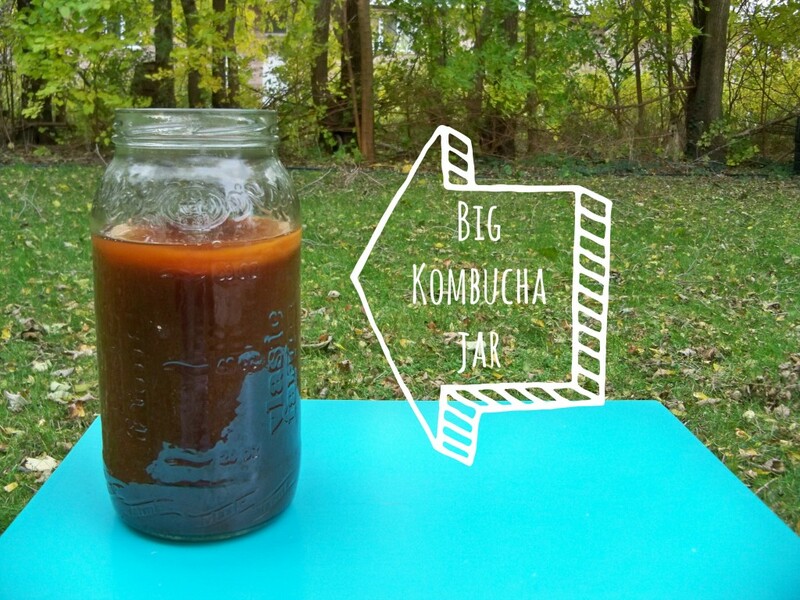 The last installment of my How to Brew Your Own Kombucha series! 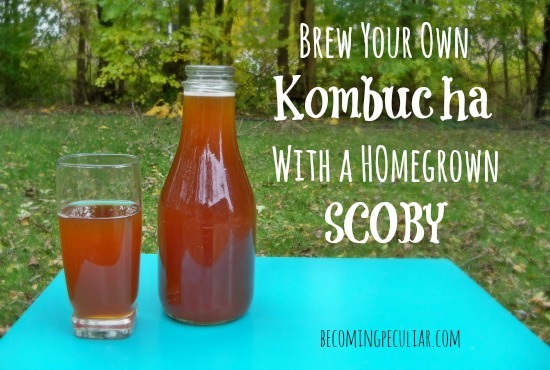 Last week I explained how to grow your own SCOBY from store-bought kombucha (Stage One); I then proceeded to share how you can brew your own kombucha from a home-grown SCOBY (Stage Two). 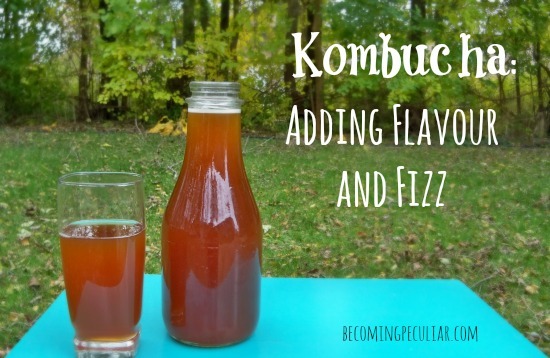 Next, I want to explore how to keep brewing kombucha, as well as flavouring and carbonating your kombucha to make it that much more fantastic. STAGE THREE: Make Your Kombucha Extra-Tasty! 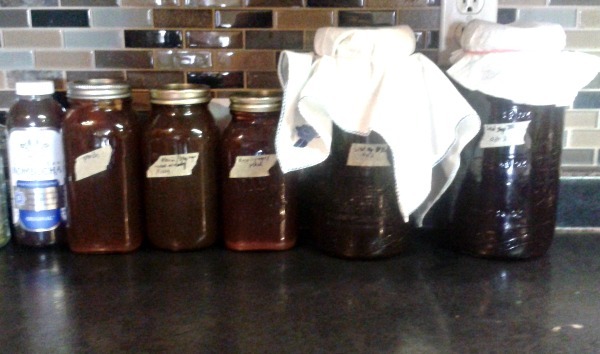 So, if you’ve managed to let your homegrown SCOBY float around in your sweetened tea for another whole week as I discussed in my last post: congratulations! You should have your very first batch of kombucha!! 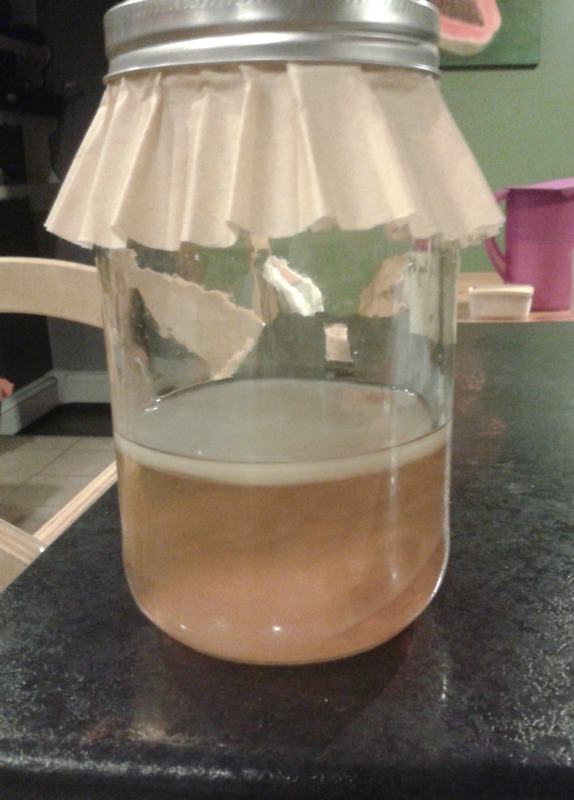 Like I mentioned in my last post, If your SCOBY sank, you probably have a new thin film growing on top of your kombucha, in addition to the SCOBY you grew earlier. This film is a new SCOBY (often called a “baby”), which can eventually be used for brewing more kombucha, but it’s probably too thin to do much with right now. You might want to grow it a little bigger in following cycles. I’ll tell you more about that later. 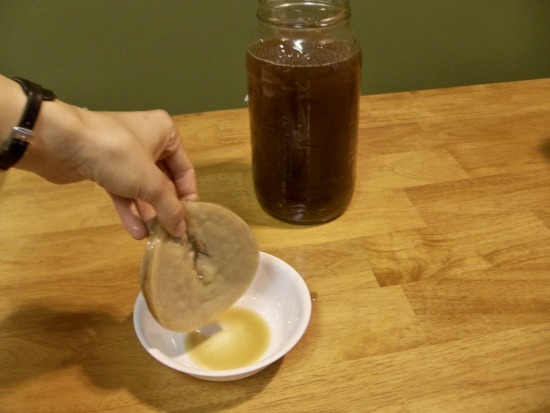 For now, you’ll probably want to keep using your first SCOBY for your next batch of kombucha. 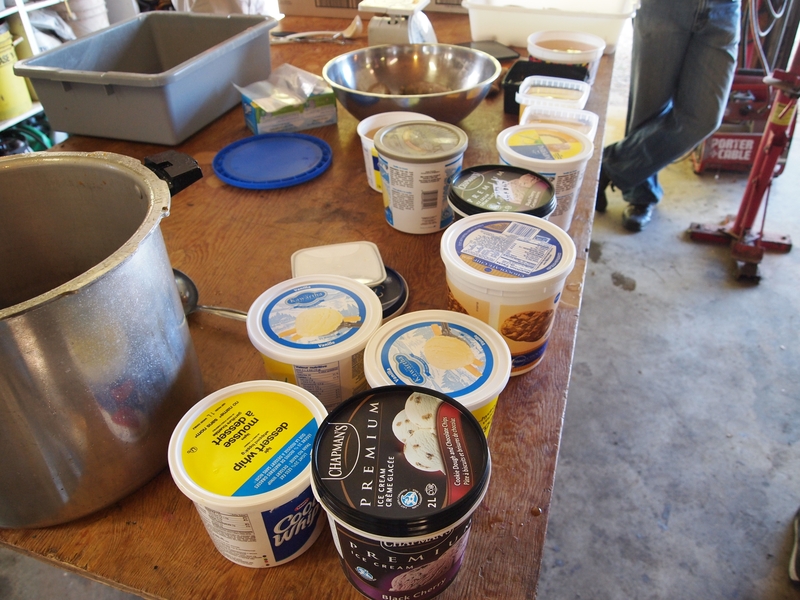 It can be used for dozens of batches, and will just keep growing (if you can get it to float on top!). 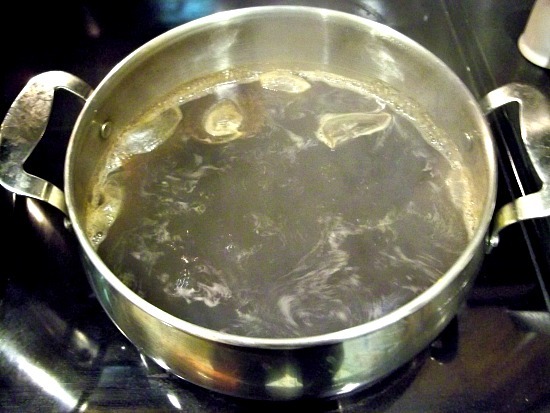 Before you do anything, start brewing your next batch sweetened tea for your next batch of kombucha, using the recipe/method from my last post: 10 cups of water, 3/4 cups sugar, 6 bags of tea. Just bring it all to a boil on your stovetop and then let it cool. Remove your SCOBY(s) and set it/them in a bowl. Cover with a little kombucha to keep it from drying out. I know. I take amazing photos. 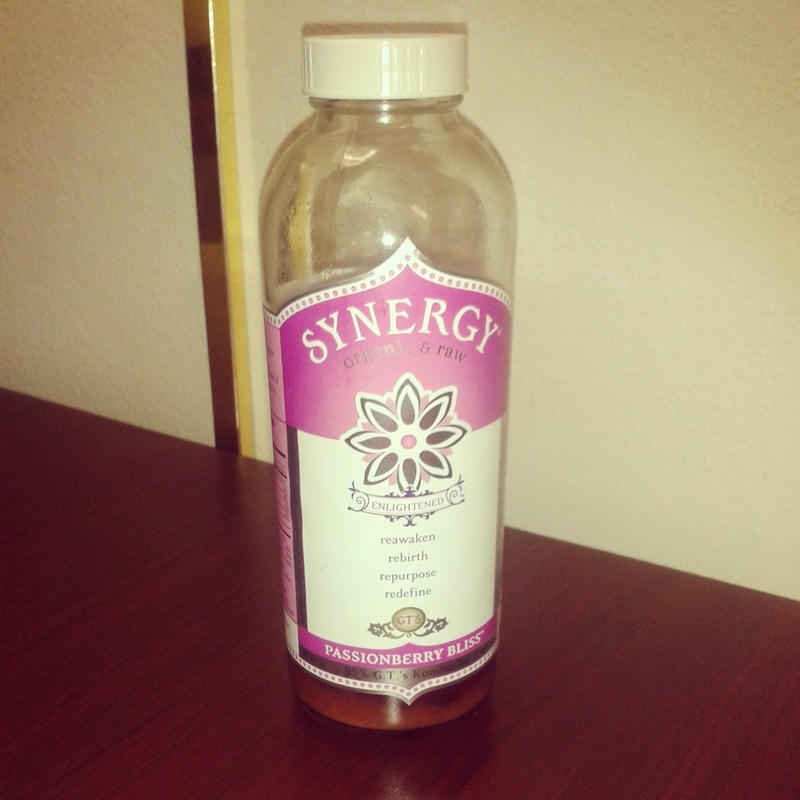 Now, you can drink your kombucha just the way it is. Just pour into a couple of bottles and enjoy. It should be tangy and slightly sweet — kind of cidery — and no longer taste at all like tea. But don’t get greedy and drink all of it — you’ll want to save some for your next batch (at least a cup). Your first brew is probably not very fizzy, if at all. That’s okay. If you really want fizz, take heart: in a few more cycles, you can probably get a good carbonation going, as your SCOBY gets more mature. Get out a couple of quart jars with lids. Add whatever juices, fruits, or spices you want to use to flavour your kombucha. I have found that my favourite combination is raspberry-ginger. 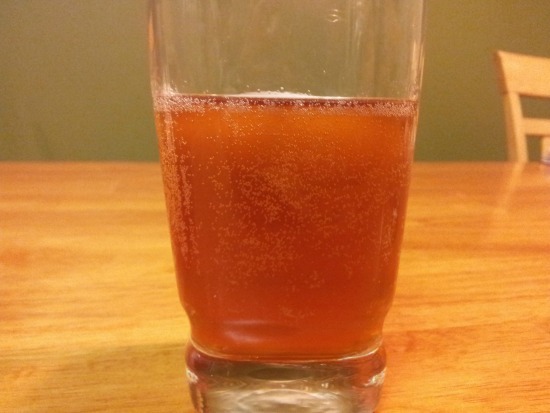 It creates a drink reminiscent of cranberry ginger ale. Rosy, fruity, and slightly spicy. Whatever you choose, you’ll need about a quarter cup of fruit juice. You can add fresh fruit, too, but I’ve had the best flavour results with juice. So far I’ve also tried pieces of fresh peach, blueberries, strawberries, and raspberries: I recently tried apple-cinammon (using apple cider and a piece of cinnamon stick. I wasn’t a fan). Your call. Sometimes I’ll add half a teaspoon of sugar to each jar, too, to further aid in carbonation. Then add your kombucha to be flavoured. Fill it up almost to the top — leaving only a quarter-inch/centimeter of space at the top. The gases need to build up pressure to create the fizz. If you don’t want to flavour your kombucha but want the fizz, skip the fruit juice but do the rest — add the sugar and pour the kombucha into new jars and seal. I still recommend a little bit of ginger, though. 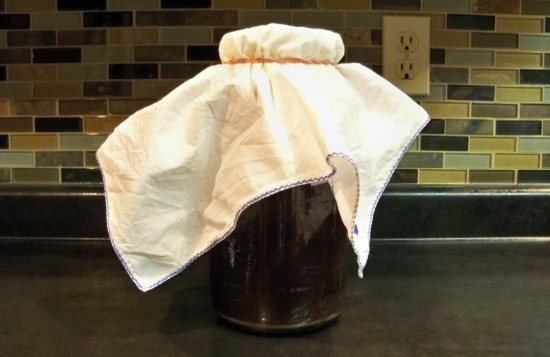 Going back to your flavoured kombucha: now tightly cap your jars/bottles and put them back where they were fermenting before — somewhere out of direct sunlight. They’ll have to stay there for a couple more days. Like I said, you want to let your flavoured kombucha jars sit for another 5 days or so, for the flavours to steep and for the carbon dioxide to build up. You might notice that the lid becomes stiff from the carbonation inside. This is a good sign. After that, pop your jars of flavoured kombucha in the fridge to chill. If you grew your own SCOBY, it’s probably been close to six weeks since you started your kombucha adventure. But it’ll be so worth it. Now your delightfully healthy drink should be lightly bubbly and full of complex flavour — as addictive and delightful as soda, without the deleterious effect on your body! Future batches will be way easier to make, and you won’t be feeling so impatient because you already have some in your fridge. Before drinking, just remember that another thin film will have formed on top of your kombucha (another tiny baby SCOBY). Just scoop it off and compost it. Some people talk about jars exploding and kombucha fizzing out all over the place when they open them up, but I’ve never gotten anywhere near that amount of carbonation. Just a light fizz to make it sparkle. With my best batches, I get a little bit of a chhhhhh when I open the lid. It’s terribly satisfying. There you have it! Once you get the hang of it it’s actually very simple. Then you can start experimenting with different kinds of teas (I’m starting to explore different proportions of green and white teas in combination with black), fruits and spices. Any questions, or tips of your own? Folks: after years of wanting to brew my own kombucha, I’m finally doing it. I’ve been brewing my own kombucha successfully for a couple of months, and it has become my favourite beverage. I drink it every day. Also? It’s easy! I can’t believe I was ever intimidated by this! And I never even had to buy a SCOBY! 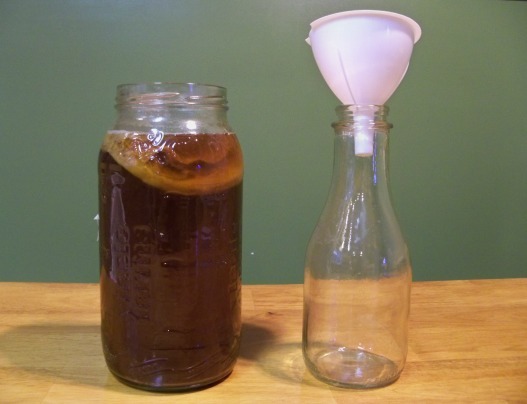 Want to find out how you can make your own kombucha without the costly investment of buying a SCOBY? 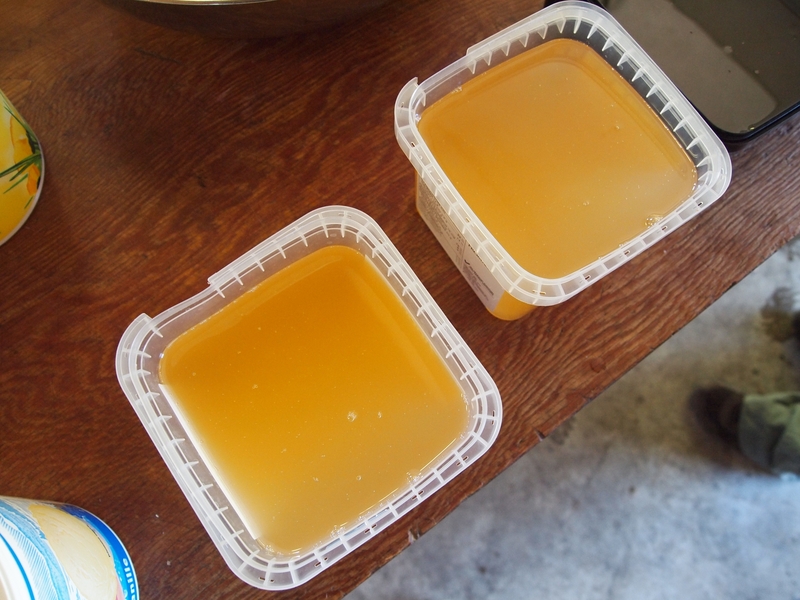 In this post, I’ll tell you how to grow your own SCOBY. 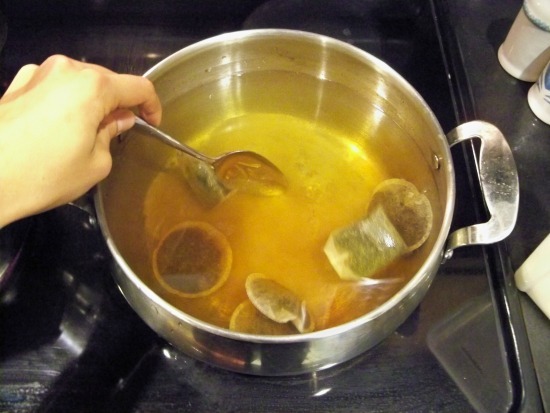 Next, I’ll share how to start brewing your first batch of kombucha. For the first step, all you need to begin is a bottle of ready-made kombucha and a whole lotta patience. Read on . . .
I’ve been interested in kombucha for years. A fizzy, tangy-sweet probiotic drink that’s good for you? Sign me up! I started getting into Traditional Foods back in 2010 when I was trying to learn how to conceive naturally. I started soaking grains and consuming saturated fats and fermenting vegetables. But the one thing that continually stumped me was beverages. Basically all conventional beverages are problematic — conventional pasteurized milk; pasteurized fruit juice; chlorinated/fluoridated tap water; and obviously, worst of all, SODA (or as we call it around here, POP). None of these drinks are anything like what our ancestors drank. I personally don’t care for coffee or tea. Wine and beer aren’t completely horrible, but you don’t want to make them staples of your diet, especially when you’re pregnant. What is a gal to drink? 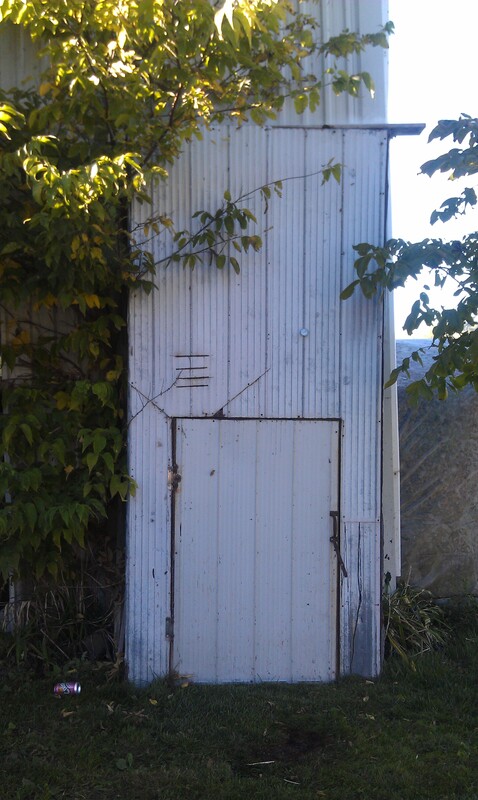 I eventually was able to source some raw milk, but otherwise we began to drink mostly filtered water in our house. I got used to it, but I often craved something a little more exciting. Everyone in the Traditional Foods world seemed to be brewing and drinking kombucha. Everything I heard about it sounded great — healthful, tasty, and slightly effervescent like pop. It sounded like the perfect solution. The trouble is, before I could start making my own kombucha, I needed a SCOBY (an acronym for Symbiotic Culture of Bacteria and Yeast — the thing that turns sweetened tea into kombucha. It’s sometimes called a “mother” or “kombucha mushroom”). 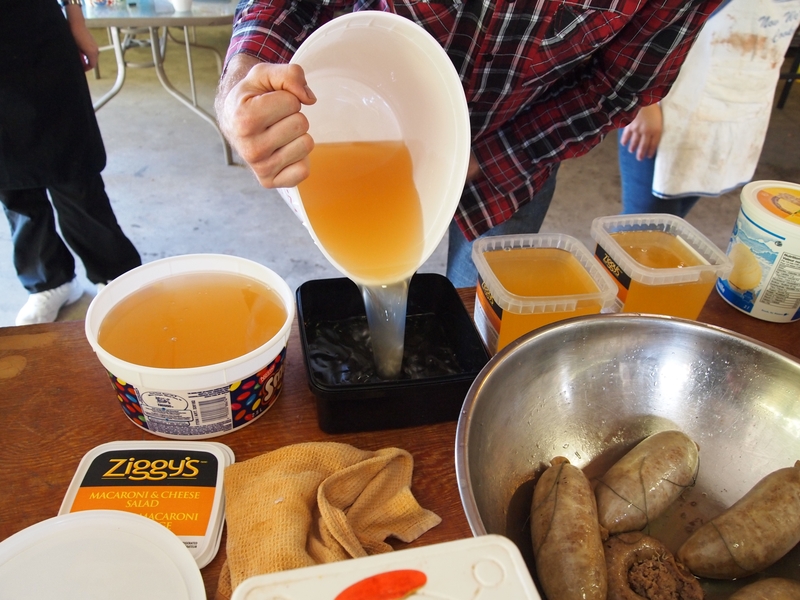 You can get SCOBYs from other people who brew kombucha, but I didn’t personally know a single person who was into traditional foods (I only knew people online). You can also buy SCOBYs online, but they’re expensive (and shipping in Canada is terribly expensive), and I was hesitant to make the investment without having ever tasted the stuff. I didn’t know where I could buy it ready-made. What if it was gross? And what if I messed it up? So kombucha remained a thing of my dreams. Then, while my family was in the U.S. for the weekend, I found bottled kombucha available at the local Whole Foods store. Hallelujah! It was love at first sip. I had to have more of it. And I pretty much went ballistic when I discovered kombucha is super-high in B-vitamins — something I’m constantly trying to get more of, in an attempt to balance my hormones. But at $3.50 a bottle and only available on the other side of the border, I wasn’t likely to be purchasing it in large quantities. (Note: I have since discovered a couple of Canadian suppliers, but it’s still expensive and hard to get your hands on). Anyway, in a moment of serendipity, I posted a photo of my store-bought kombucha on Instagram, saying that I wished I had a SCOBY so I could brew my own. And to my great joy, LilyGirl explained that I could, in fact, brew my own kombucha with that very bottle! Woohoo! I bought another bottle of kombucha, took it home, and got to work. 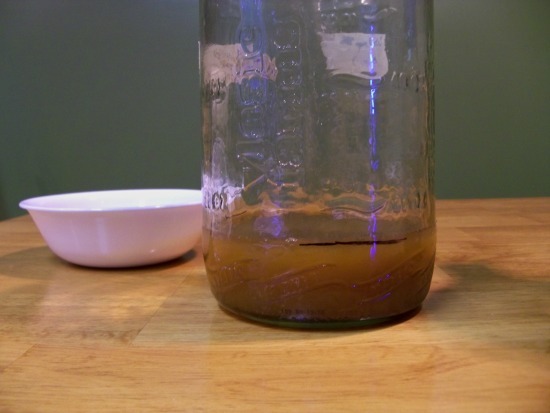 To be clear: you do need a SCOBY to brew kombucha. 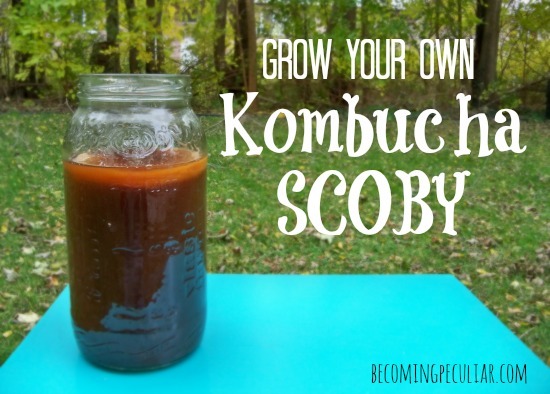 But you can easily grow your own from a bottle of pre-made kombucha! To begin, you’ll need a bottle of unflavoured store-bought kombucha. It needs to be unpasteurized/raw. I personally used GT’s Synergy Original. 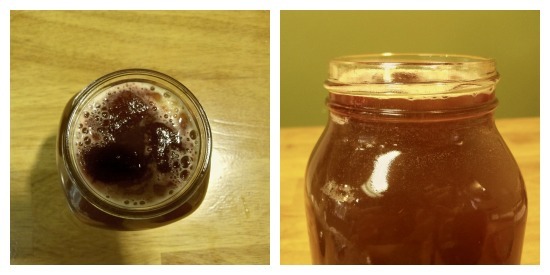 Pour the bottle of kombucha into a clean mason jar. A quart jar is a good size. Let it sit on your counter for a couple weeks until a white film begins to form on the top. Don’t jostle it or it will sink and you will have to start all over again (I learned this the hard way). The film will continue to grow thicker as it sits on your counter. Once it’s about a quarter-inch thick, you’re good to go. In August, it took me about 3 weeks to get it this thick. Now in November, with the cooler temperatures, it takes closer to a month. And that’s it! You have your own SCOBY! Time to start brewing! 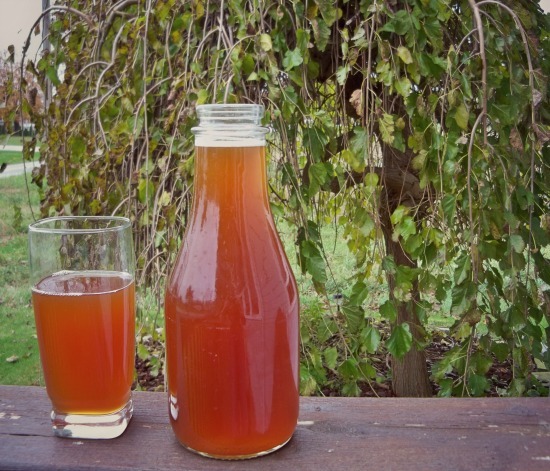 In my next post, I’ll explain how to brew your very first batch of kombucha. Any questions? Have you tried this? How successful were you? 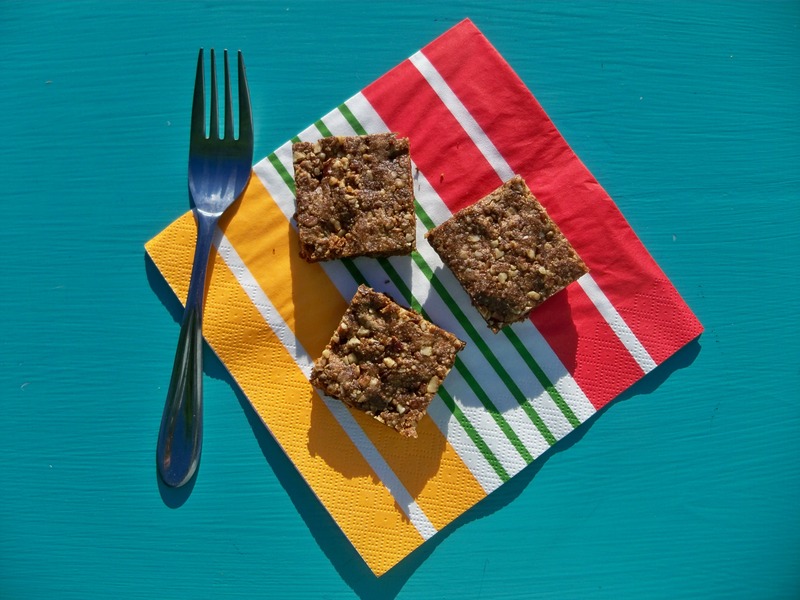 This recipe is adapted from Katie Kimball’s Protein Bars, from the e-book Healthy Snacks to Go. 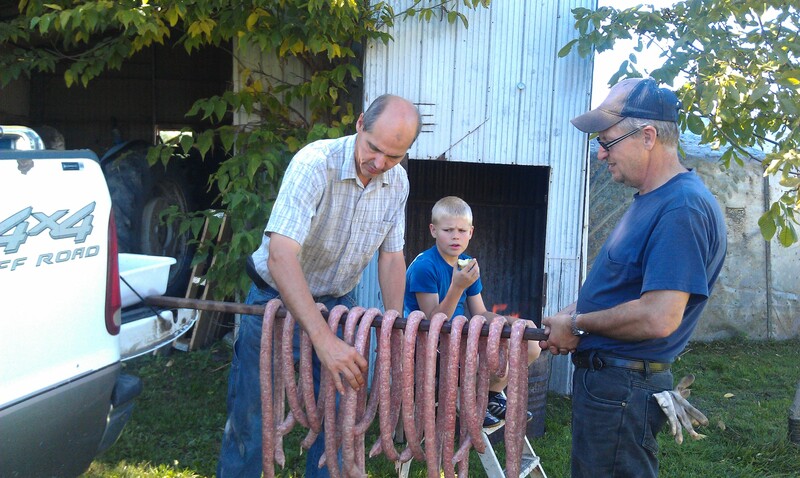 I’ve made them a bunch of times, and everyone in the family loves them. 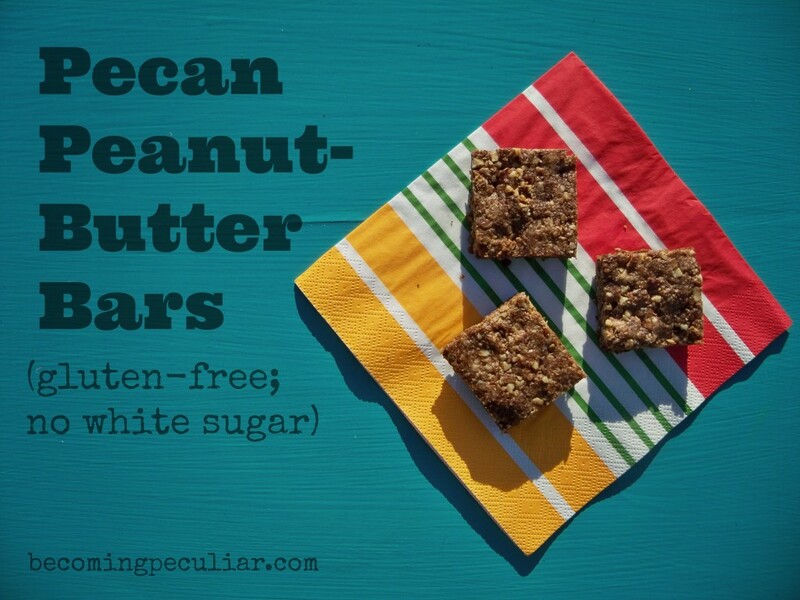 Katie says you can substitute any nut for the pecans, but I suspect the pecans contribute quite a bit of their natural sweetness to this tasty snack, which is why they need so little additional sweetener. 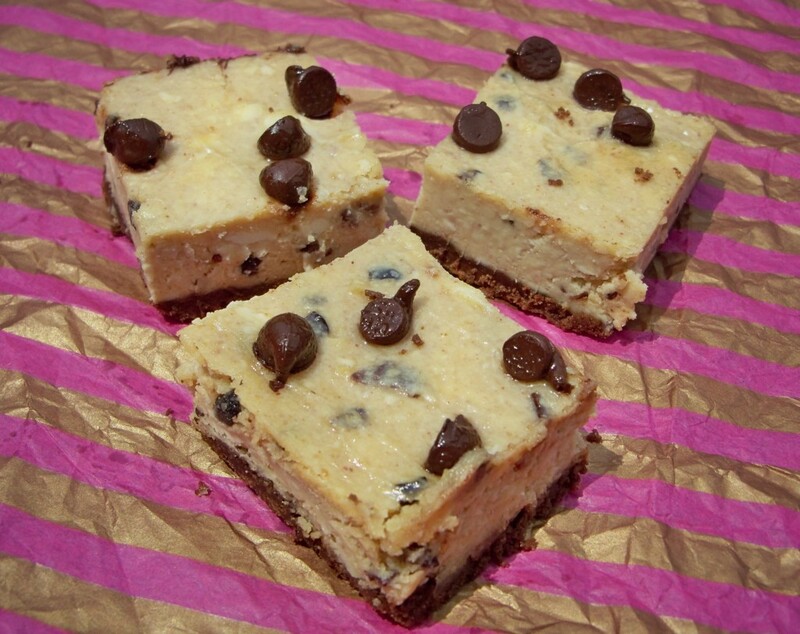 Her recipe also includes 1/4 cup optional chocolate chips, but I don’t find them necessary. Your family might, if you’re used to sweeter treats. Another bonus with this recipe is that it contains molasses, which is high in vitamin B6 (something my body tends to need), iron, potassium, and calcium. All important nutrients. It doesn’t taste very strong, though — the peanut butter seems to mask the flavour. You might want to start out with only two tablespoons and work your way up if you’re not fond of molasses. Personally, I find that after one taste of these bars, I start to crave more of the molasses flavour. Perhaps my body recognizes and appreciates the Vitamin B boost? 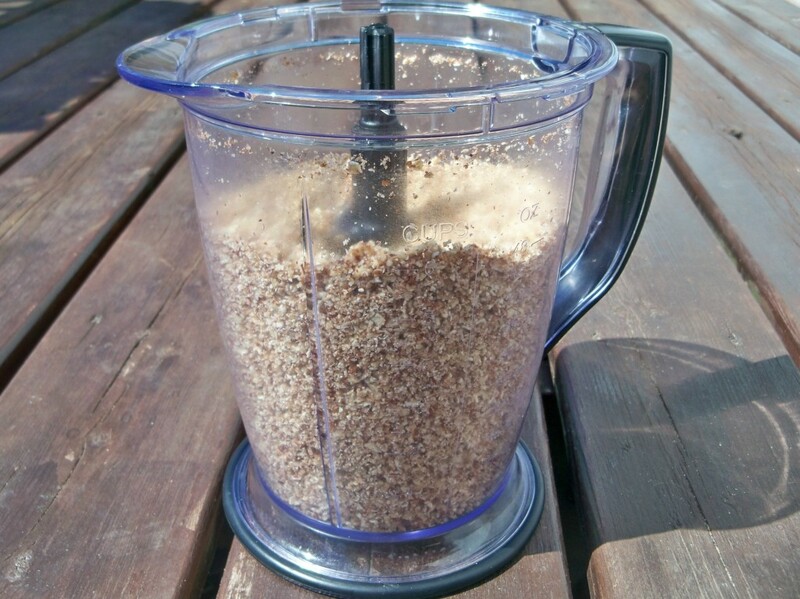 Process nuts in a food processor until they become a coarse meal. 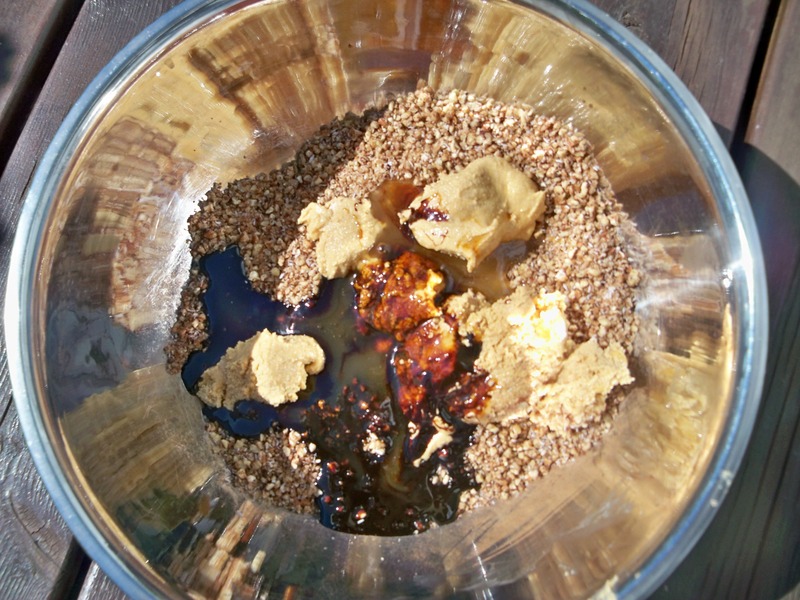 Pour nuts into a large bowl and mix in the remaining dry ingredients, followed by the peanut butter, molasses, honey, and vanilla. 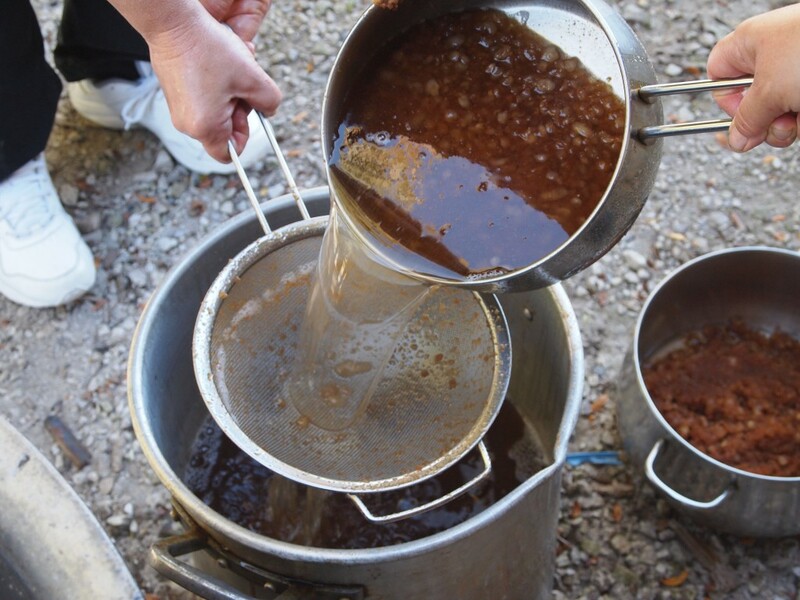 Stir well, until it all sticks together. 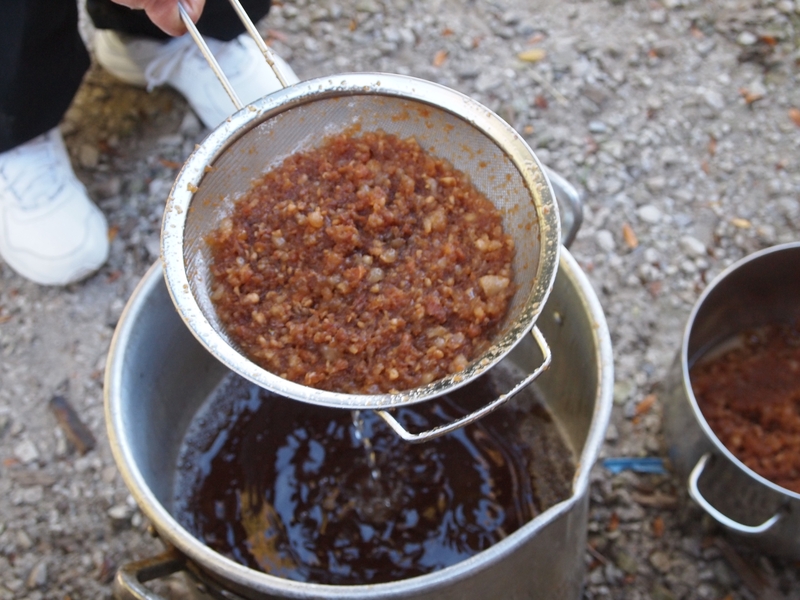 Add a drizzle of honey or maple syrup if it’s too dry. Grease a glass 8-inch square pan. 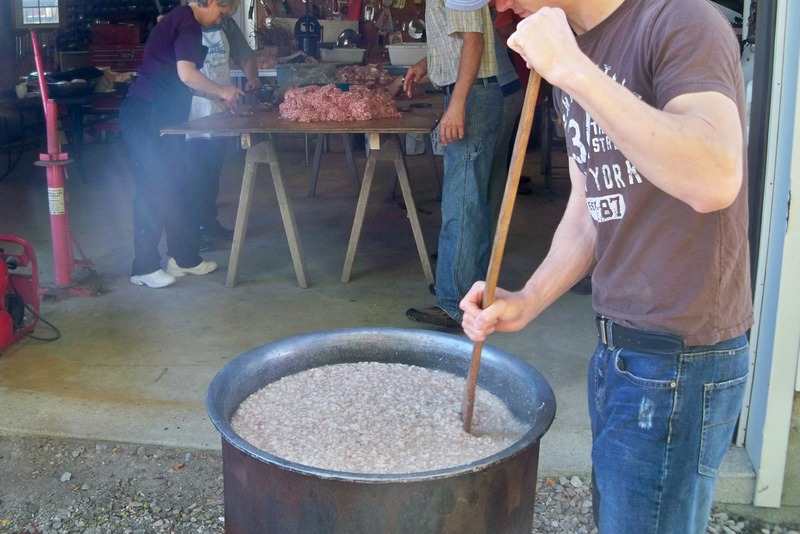 Pour in nut mixture and press flat (It may help to moisten your hands first, if it’s really sticky). Bake for 45-60 minutes, or until golden around the edges. 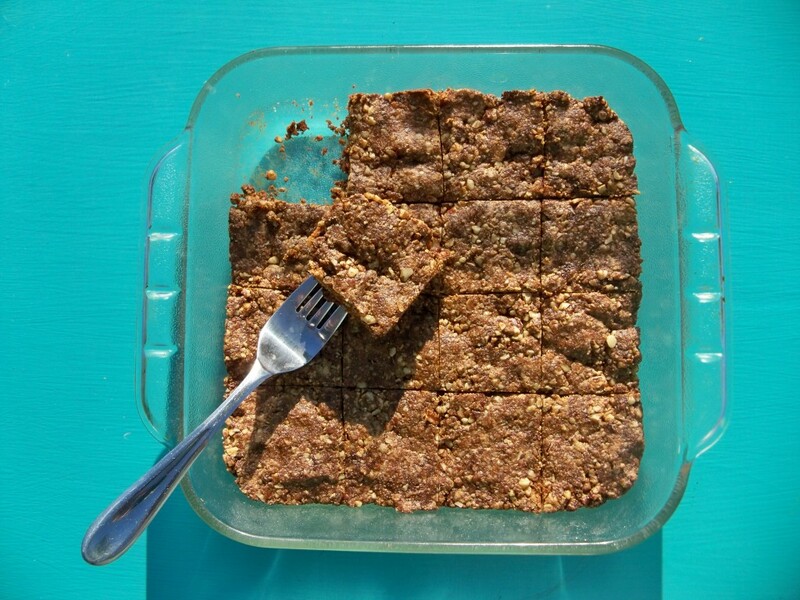 Allow to cool, and then cut into bars with a sharp knife. Voila! Store in the refrigerator for best quality.